The unfortunate fact is that most Arizona residents, at some point in their life, will be injured by slipping and falling. If you are injured in a place of business you may be able to file a valid legal claim against that business. It doesn’t matter if the business is large or small, any business whose premises are open to the public is under the obligation to take necessary steps to keep their customers as safe as possible. If you are injured in a store you should seek the counsel of an Arizona personal injury lawyer, or a specialized slip and fall lawyer. If it can be shown that the injury happened due to unsafe conditions at the business site, the store may be responsible for compensating you. Slipping and falling in a store can happen for numerous reasons such as the store or a parking lot may have poor lighting. Snow, ice, or water may be allowed to accumulate at the entryway or on the floor. Any liquid spilled on the floor is a hazard. Basically, whatever the cause of your slip and fall, the liability of the store will depend upon whether the store should have reasonably had notice of the unsafe condition and failed to take prompt action to remedy the problem. Accidents generally happens for a reason. The Occupational Safety and Health Administration has found that 90% of customer accidents result from some form of negligence. 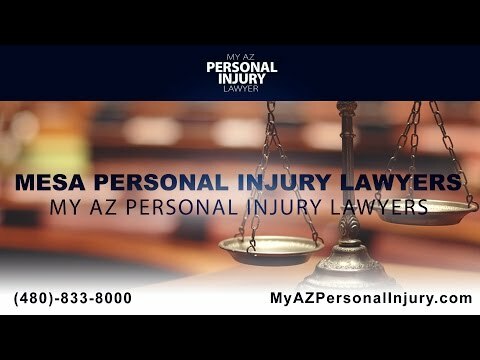 That’s why you should contact an Arizona personal injury lawyer or a Mesa slip and fall lawyer if you are injured in a store. Following are some examples of lawsuits regarding slip and falls accidents in stores. At a Michigan Sam’s Club, a 53-year-old surgeon tripped over part of a trailer hitch in the parking lot, while carrying some large bulky items. He suffered a life altering spinal injury which left him with continually shaking hands. The injury subsequently ended his career. The surgeon charged that the trailer hitch should have been marked with a cone or roped off. He received nearly $4 million for his loss of future income. In another personal injury case against Sam’s Club an elderly woman suffered a broken hip when she tripped over a ridge in the store’s entry ramp that was nearly an inch higher than the pavement. It was shown that employees were aware of the problem. She was originally awarded $400,000 in damages, but a later court ruled that she was only entitled to $180,000 in compensation. In a personal injury case filed against Walmart, a young woman slipped and fell on ice outside the store. To make matters worse, after she felt she was hit by a falling sheet of ice that slid from the roof above her. She suffered an injury to her arm so severe that she was left unable to use that hand. Walmart stated that contrary to her claim, the roof was properly designed, and that in addition an employee had told the woman to remain inside but she went out anyway. The jury found in favor of the injured woman and awarded her $600,000. In a slip and fall case filed against Costco, a man slipped on a puddle of spilled liquid soap inside the store. The fall shattered his kneecap and he suffered permanent partial loss of mobility and permanent pain in his knee. Camera footage showed evidence that several employees had walked past the spill and failed to clean it up. The jury awarded him $400,000 for medical expenses and pain and suffering. While most business owners do everything in their power to keep their place of business free of hazards, with so many people in and out each day, accidents and injuries do happen. Under the law you are entitled to be safe from harm at a place of business. This involves all areas, including restrooms and parking lots. The same laws also protect wholesalers, deliverymen, etc. Anyone who is there with the purpose of conducting any type of commercial activity. Duty of care is a legal term that refers to the responsibility a business undertakes to do everything possible to ensure your safety while on their premises. When someone is injured in a store due to some form of negligence by the storeowner the law calls that a breach of the duty of care. If you can prove that the business owner was negligent, and that negligence was the cause of your injury, you may be entitled to a settlement. However, there are hundreds of thousands of slip and fall accidents like the examples we have discussed, and not all cases are settled in favor of the injured party. If you are injured in a slip and fall accident in a store here are some things you can do to build a legal case that holds the store owner responsible. No matter where the accident occurs, whether inside or out in the parking lot, report it to the business owner or manager. Ask them to make a written report with the details of the accident in writing and request a copy for yourself. Ask them to call 911. Ask that the EMTs and ER staff document your injuries and how they were acquired. After you have been cared for at the ER follow up with your own physician a few days later. Medical records are important evidence if you choose to seek compensation for your injuries. Document every detail while it is fresh in your mind. Try to get names and phone numbers of potential witnesses. Take pictures of the location where you fell, being certain to photograph any contributing factors such as ice or spilled liquids. Document the exact time and date. If you have been injured in a slip and fall accident do not give any statements to the storeowner or an insurance company until you have spoken with a slip and fall lawyer. A slip and fall injury can irrevocably change your life through loss of income, medical bills and possibly the inability to care for yourself and family. My AZ Lawyers law firm offers free case evaluations. Our Arizona personal injury lawyers have decades of experience in helping clients like yourself receive just compensation. If you have been injured due to someone else’s negligence you have rights, and my AZ personal injury lawyers are the team that will fight for those rights.